All it takes is a catalyst. For the past 48 hours, this empty parcel came to life with a group of designers, architects and artists from around the world, who imprinted this build with their creativity – riffing and building on what others had created, and adding their own voice. 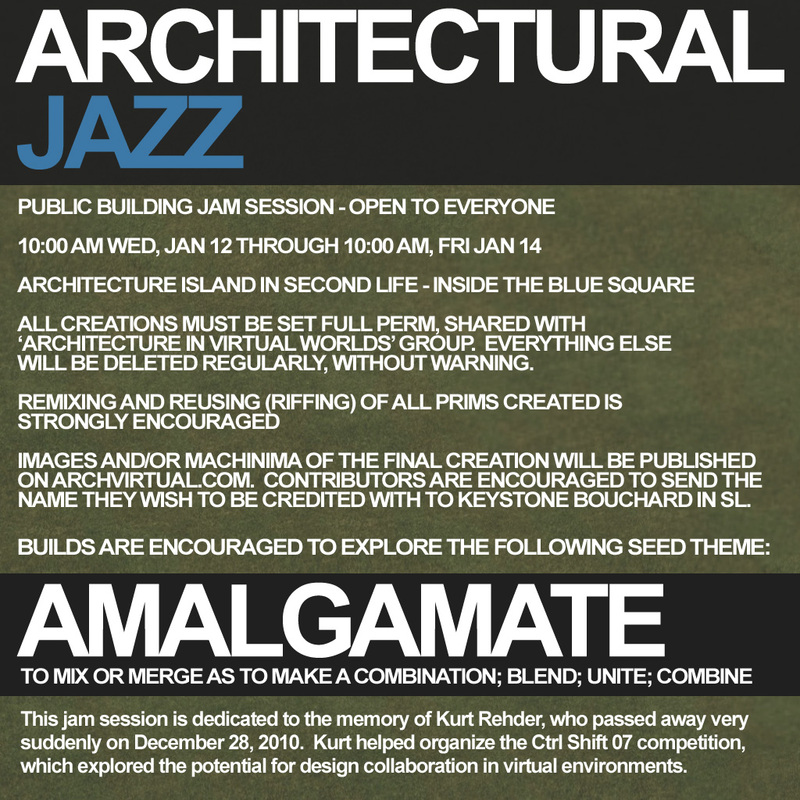 Dust off your prims folks, we’re kicking off a public building jam session on Architecture Island in Second Life, focused on the seed theme ‘Amalgamate’ (to mix or merge as to make a combination; blend; unite’ combine). Head over to Architecture Island (here‘s the slurl), and rez some prims! Be sure to join and activate the ‘Architecture in Virtual Worlds’ group, and set everything you build to share with full perms. That way, others can ‘riff’ off of your builds, and you can do the same with anything else you see that inspires you. We call it Architectural Jazz, and it’s a great way to expend some creative energies, have fun and meet other builders, designers and architects. Kick off is today at 10:00 AM PDT, and the build will run through Friday, January 14th at 10:00 AM PDT. We’re hosting this project in memory of Kurt Rehder, who passed away very suddenly on December 28, 2010. Kurt helped organize the Ctrl Shift 07 competition in Second Life, which explored the potential for design collaboration in virtual environments.